While most MARC records transfer smoothly from Orbis and Morris to Quicksearch, sometimes things go wrong and discrepancies between the systems arise. The recent development and implementation of an automated daily audit process ensures that these errors will be identified and routed for correction swiftly. The audit script runs each time Quicksearch processes a fresh extract of records from Orbis or Morris. The script identifies the record IDs from the processed extract files. It then contacts the Quicksearch Solr index to acquire an up-to-date list of all the record IDs in Quicksearch, as well as the date each record was last updated. By comparing the extract files to the contents of the index, the script checks that all added records are present with a current update date, and that all deleted or suppressed records have been removed. A notification e-mail immediately reports the audit results to the Quicksearch project team, and includes file attachments listing the record IDs that failed to be processed correctly. These errors are collected, analyzed to determine appropriate handling, and routed to Catalog & Metadata Services or Law Library staff for review. The next phase in development is for the script to send the daily audit results to a local database, which will in turn power a publicly available visualization that updates in real time, illustrating the volume of catalog records that YUL staff create or update on a daily basis, and charting their flow from Orbis and Morris into Quicksearch. Production Quicksearch is now supported by not one, but two separate servers that are mediated by something called an F5 load balancer. An F5 load balancer acts like a traffic light; for each incoming user request, and it will look to see which of our two production servers is least busy, and direct traffic to that server. This balanced approach has several advantages. First, Quicksearch will be able to handle the level of traffic currently experienced by Orbis and Orbexpress. Second, in the event of a server failure, the load balancer will automatically direct all traffic to the server that is currently up, with no visible downtime for users. We are implementing a new approach to Google Analytics that will enable analytics-driven change in Quicksearch. Quicksearch has been upgraded to use both Google Analytics Universal code and the new Google Tag Manager application. Google Tag Manager will allow us to more easily track user behavior. We also developed custom code specifically for identifying the broad use of items by location and call number. The setup was driven by small group discussions between Library IT and Sarah Tudesco, with the goal of setting up analytics using similar approaches in all of the applications supported by Library IT. These new analytics will be analyzed over the summer and tweaked as necessary. Our goal is to finalize our setup by September 2015. Daily record extract and load workflows are being finalized. For example, a daily Audit script of all loading activities has been added. The Audit script generates a list of records rejected by Quicksearch for clean up in Orbis or Morris. The statistics associated with each load will be publicly available in the near future in a graphical dashboard. A full audit workflow also now exists to compare all publicly-available records in Orbis, Morris, and Quicksearch, and generate a list of any records out of sync between the three public OPACs. 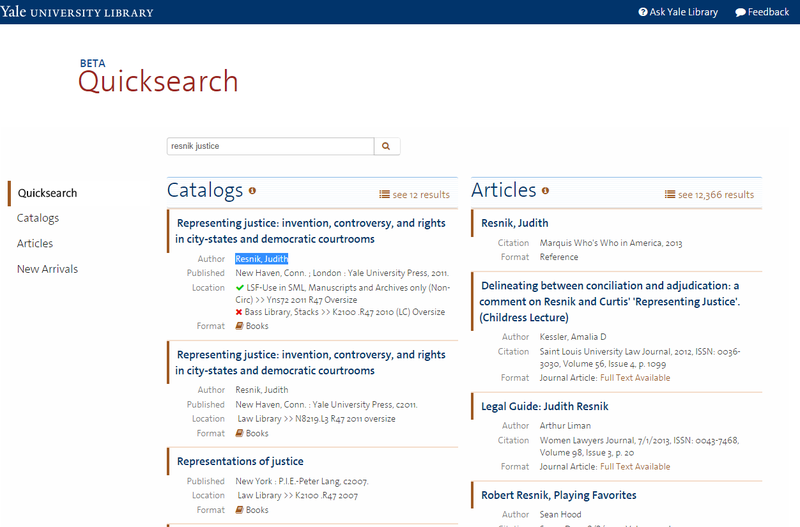 What’s up next in the Quicksearch project? Work is in progress to integrate the display of Morris holdings. 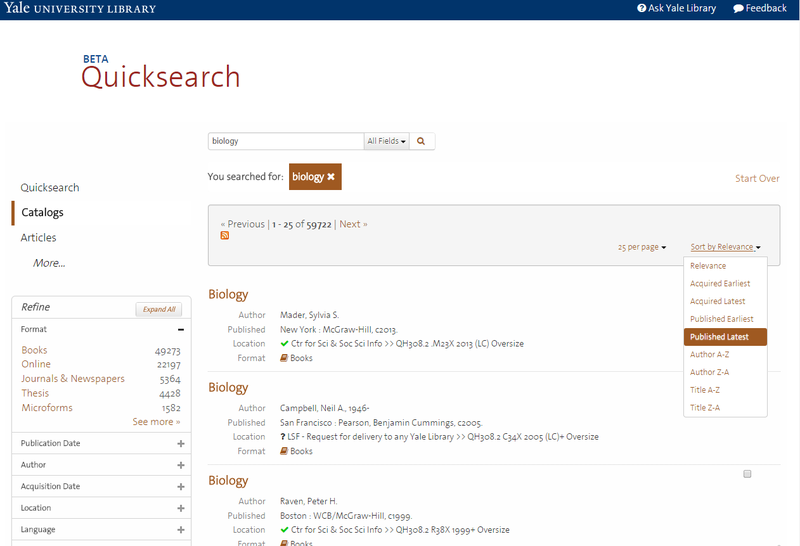 We’re also creating public-facing Help documentation for Quicksearch users. A sub-group of the Quicksearch Implementation team has formed to create this documentation, and will be working in consultation with the User Experience Strategy Group. Re-discover Discovery and other staff sessions will be planned for late summer to support library instruction, in consultation with public services staff. Quicksearch is still on target to replace Orbis as the default search on the Library Front Door in January 2016! Several new features and bug fixes are being rolled out in the first two weeks of April. URL Links stored in the MFHD are now extracted and will appear in the holdings section of the item view. For a full list of bugs fixed in the April update, see the Quicksearch 4.0 Release Notes. 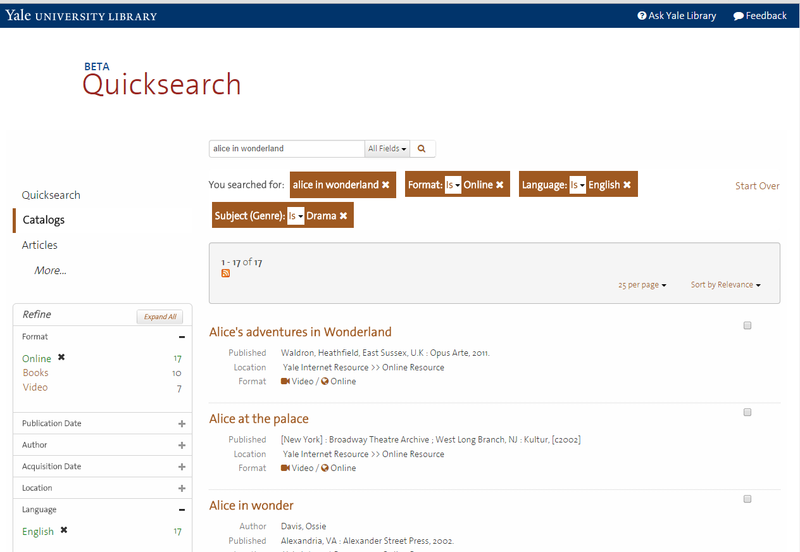 Quicksearch handles formats, such as “Books” or “Audio,” in a modular, layerable structure that is very different from Orbis. For example, manuscript maps are not treated as a separate format from print maps or other manuscript materials, but rather have both the “Archives or Manuscripts” and “Maps & GIS” formats assigned, and can be accessed through either facet or a combination of the two. During the record ingest process, a script analyzes the MARC data to determine which format terms to apply to the record, according to conditions described in the format mapping documentation linked below. This mapping was developed in collaboration between the Quicksearch Implementation Group and the Discovery & Systems Metadata Group, drawing upon MARC documentation, local practices, metadata analysis, and Yufind discussions. It continues to be refined as Quicksearch develops. Library IT and the Quicksearch Implementation team are preparing to do a code rollout for Quicksearch Beta next week. After the code rollout staff will test Quicksearch beta. When it is determined that the code rollout was successful, our new web developer Steve Wieda will be putting a link to Quicksearch beta on the YUL homepage http://web.library.yale.edu/ the following Thursday February 5th. This will begin the public beta testing period for Quicksearch! The link will be under the search box in “Search Orbis Catalog” section on the left side of the page. 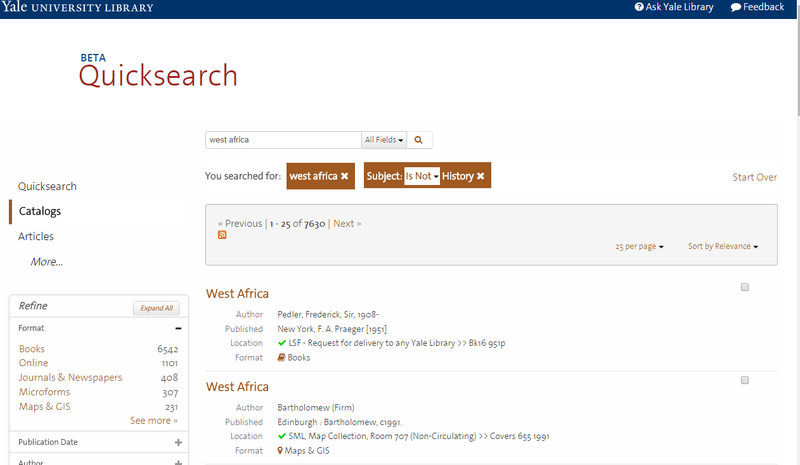 It will read “Try Quicksearch beta!” Clicking on this link will take you to http://search.library.yale.edu/. Links will also be available in the ‘Research’ box on the home page, and from the ‘Research’ drop-down in the header. 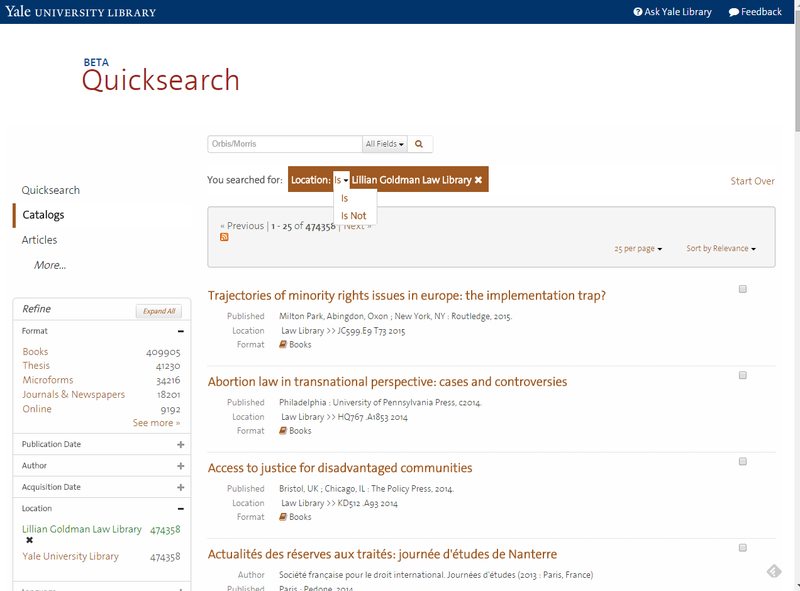 A description of the latest Quicksearch features is available in the Quicksearch blog at http://libraryunifiedsearch.commons.yale.edu/. The major enhancement rolling out next week will be to re-name the ‘Catalogs’ section to ‘Books+’. We are making this change based on undergraduate and graduate student feedback in user studies this fall. A number of other small interface changes will be made as well. Over the next several weeks, we will be offering brief information / demo sessions. Stay tuned for more information on dates. Please note that because Quicksearch is still in Beta, it will be supported from Monday – Friday, 8am-5pm only. It will also be subject to outages as we continue to address issues and add new features. Simple Item Status messages have also been enhanced. Previously, Item Statuses in Quicksearch displayed as one of two values – ”Available” or ”Unavailable”. Item Statuses have now been enhanced to display a greater level of detail. Messages like ”Lost” or ”Checked-out,” for example, now convey more information to users about availability of a title. This is just a short list… What Quicksearch beta features have you found to be useful or interesting? Let us know via the feedback form! More information and tips on Quicksearch beta features and functionality to come! 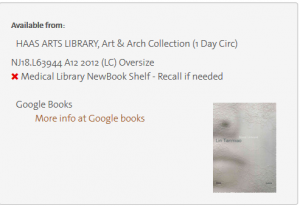 As Scott noted in his post on Morris records in Quicksearch, we are not deduplicating records between catalogs at this time. Stay tuned for more updates on the Quicksearch project! The Law Library’s catalog, MORRIS, holds just over 900 thousand bibliographic records. When you view the entire Lillian Goldman Law Library location facet in Quicksearch, you’ll see only about 500 thousand records. When merging the records from two different systems, we had to make some choices about what to send to the joint database that drives Quicksearch. Here’s a summary of what records are included from the Law Library catalog. We did not send two large categories of records from MORRIS: sets of records we knew were already in Orbis, and temporary records for items on order. For example, MORRIS includes many Project MUSE ebook records. Because these are already in Orbis, we did not send these records from MORRIS. Some large sets of microform materials are excluded because they are duplicated by online materials. Serials Solutions records are also in both systems, but because Law and YUL holdings are synchronized in the Serials Solutions database, including only the YUL records will cover all the Law records. There are also a few small sets of records for materials that are only available to law students and faculty. These are not currently loaded, but as we work out licensing issues, these sets will be added. There is not currently any effort to de-duplicate records for titles that are held in both library systems, though this is a possibility for future development.